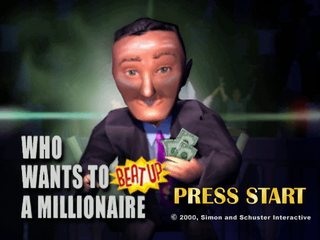 Who Wants to Beat Up a Millionaire is an odd Sega Dreamcast game which attempts to parody Who Wants to Be a Millionaire. The Dreamcast version was released exclusively in North America in 2000. The game has players answer questions, which, if completed, allows them to beat up millionaires. Main article: Who Wants to Beat Up a Millionaire/Magazine articles.